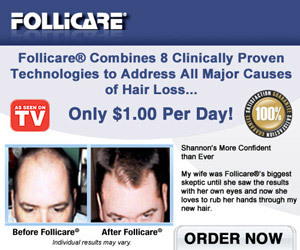 Follicare is a collection of advanced hair care products for men and women concerned about hair loss or thin looking hair. Follicare provides you with an unrivaled arsenal of powerful ingredients that are backed by clinically proven scientific research. The patented Follicare products work better because they target all the major reasons for hair loss, not just one or two. This has allowed Follicare to become an industry leader over the last seven years.